These four words are united in one powerful and transcendent symbol: the lotus flower. This flower has special importance and meaning in Hinduism and Buddhism. Growing from muddy water, it rises and floats without becoming wet or dirty, symbolizing the journey from the mires of sensual pleasures to the plane of enlightenment. In this way, the lotus represents fortune. Those who have risen above the mire recognize the difference between material fortune and spiritual fortune. We are all born into the murky waters of this word. While at some point everyone will face external adversity, the real conflict is the war within. Selfishness and attachment to sensual pleasures are the cause of this conflict. By renouncing selfish desire and sense craving, the wise are neither “agitated by grief nor hankering for pleasure, they [instead] live free from lust and fear and anger” (Gita, 2.56) In this way, the lotus represents purification.Those who are working to escape above the muddy waters must purify themselves. 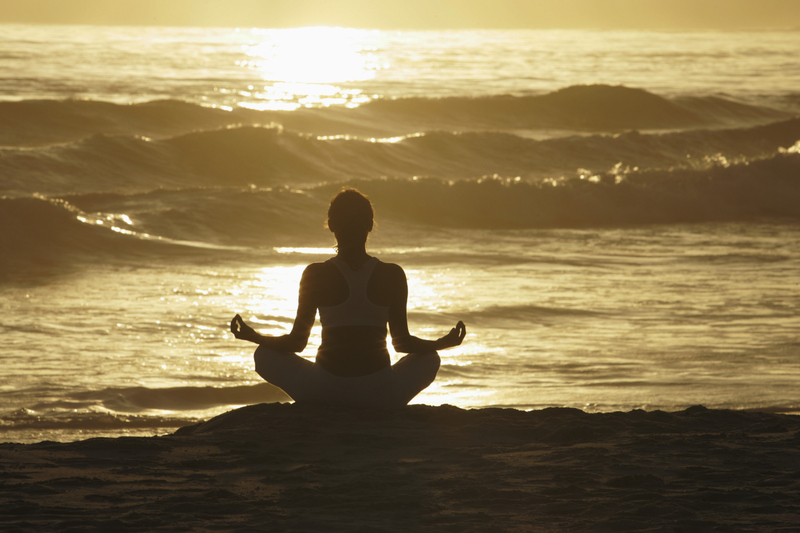 Purification and enlightenment are the goal, but there are many paths to that goal. Each creature, according to it’s nature, must by faith find the path to the goal. Faith is expressed “in the habits of those who hold them: in the food they like, the work they do, the disciplines they practice, the gifts they give” (Gita, 17.7) Similarly, each lotus manifests a different type of faith that adapts to its nature and surrounding. In this way the lotus represents faithfulness. Those who are working to rise above the muddy waters will need to be faithful to their cause. By faithfulness one travels the path to enlightenment. Along this path they shed selfish desires and attachment to worldly objects. Ideas change and the world seems different, like a renaissance of beliefs: the dawn after one’s darkest day. Some believe this journey may span several lives and in each life lives the same Self. “As one abandons worn-out clothes and acquires new ones, so when the body is worn out a new one is acquired by the Self, who lives within” (Gita, 2.22). In this way, the lotus represents rebirth. Those who have risen above the muddy waters have been reborn. Buddha meditating in the Lotus position. Fortune, purification, faithfulness, and rebirth are characteristics that manifest in different ways; they are one in the lotus, and the lotus comes in different colors. A white lotus flower refers to purity of mind and spirit. A red lotus refers to compassion and love. The blue lotus refers to wisdom and logic, the means of enlightenment. 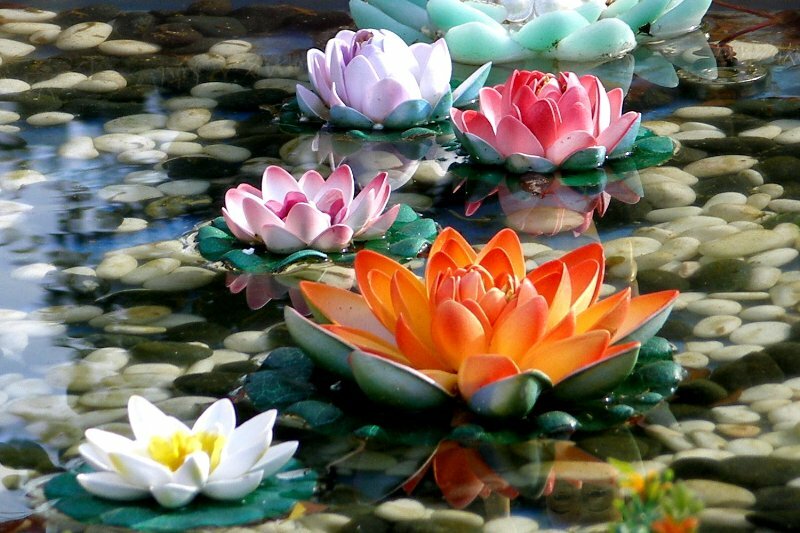 The pink lotus represents the legend of Buddha. The purple lotus refers to spirituality and mysticism. The golden lotus represents all achievement and enlightenment. What lotus color best represents you? While the color of our “inner lotus” may differ, all humans are born in the same world, a world where there is suffering and despair. As Krishna teaches Arjuna in the Bhagavad Gita, this is no reason to feel sorrow (2.11). Suffering is a vital part of human experience; it makes us stronger and teaches us how to walk along the correct path. When we are stuck in the dismal mire of suffering and sorrow, we should remember the powerful and transcendent message of the lotus. Thank you for this. I find myself “stuck in the dismal mire of suffering and sorrow”. My own life choices over the last decade coming together to form a perfect storm of toil, adversity and at times seemingly endless vistas of pain and fear. I am not Buddist, nor Hindu but I do find a peace and truth within Buddism that seems absent in some other other faiths and at this time in my life the message of the lotus is a potent one. I know not what color I might be, but I do know that I have and shall continue to persevere against the tide of joblessness, debt, homelessness and depression that threatens to crush me. I have, in the last several years been hit with many failures, many obstacles and woes that have many times brought me to my knees beneath the weight of them. But each time I have gotten back up, dusted myself off and pushed forward, the issues are still there, still heaped upon and above me, but I push onward. Hoping against hope that I shall one day find my way clear, I am in a trucking school, striving to learn in a mere 2 weeks the basic skills to safely operate a tractor-trailer that I might earn a wage that will provide food, shelter and clothing for my small family and I, that might help repay the debts my poor choices have wrought. I do not crave wealth, or luxury or materials, I just want to find a way to clear of the woes piled against me and I do so in the only path I can see. But it is hard, and I am tired and I want to lie down even it means never rising again. Despite this fatigue, this want, I continue to stand up and walk forward. Why? I see no end to it, and yet I continue to rise against it. I just want rest, safety and solace. The lotus gave me hope, but the shadows still loom and threaten to crash in upon me and I am not sure if I have the strength to rise again. Just a quick note to say you are not alone. Though I don’t know you personally, I want you to know that I am holding you in my heart and praying for you and your family to come through this time of difficulty whole and healthy. Your family needs you. Our larger family needs you. We are all connected. Not that you asked for advice, but, I was moved to relay the following to you-Chemical imbalances within the body caused by Seasonal Affective Disorder can keep one in a spiral of sad thinking, regardless of harsh realities. I knew one man who worked graveyard for years and became so depressed, his doctor told him to get off the night shift-that fixed his problem. Another thing that can cause sad thinking is chemical imbalances from the biggest drug we ingest, which is the foods we eat. I used to have melt downs every time I drank a caffeinated drink, and came down from the caffeine high, becoming a blubbering mess-then, through allergy testing found out I am highly allergic to coffee, one of the things causing the worst crash and crying spells. Another thing that I found caused “stinking thinking” as I now call it (in myself) is when I become exhausted, after a certain time at night-I used to feel like crying, like clockwork, after 9 p.m. at night, until I realized I obviously was thinking catastrophically when my body needed rest-or, from pressure before it rains, same thing…in other words, when the body is weary, or, out of balance, I find my reactions to life very much more narrow, sad, and distressing, and depressing. Not to say there are not real life problems here, on this testing ground called earth, but, the body seems separate from the spirit, yet has an effect on thinking, and, I have found, for me, anyway, eating on a regularly timed set schedule, avoiding foods that cause wildly fluctuating blood sugar crashes, also helps the body keep in better rhythm to sleep, which in turn helps the outlook. So, take a deep breath, and be aware of the body’s effects on your thinking. At those moments, remember, you are not your body, the body is a temple in which your soul is seated for this journey of life, but that, when weary, or out of balance, may be in need, in some way, which may cause your spirit to become, shall we say “maladjusted” within the vessel, seeking for the home where we all originate from (thinking only of how awful life is). For every challenge, try to remember, this too shall pass, and this time here on earth, and your particular challenges are perfect and unique to you, leading you to a higher wisdom, which, depending on your beliefs, God, and/or God and you, have chosen as your path to walk. Regardless of your beliefs, the body has needs that could be causing you more stress than you are aware, or at least I have found it to be so, for my own journey. Truly, I become quite angry or sad when my blood sugar drops, and after I eat nourishing foods, I wonder what all the fuss was about. Not to say that in the throws of these blood sugar crashes, I was aware of what was happening at the time-I was clueless. Now, I actually set an alarm to eat on a regular set schedule and avoid stressing out my body, because I would go long stretches forgetting to eat, which caused insomnia, stinking thinking and general poor outlook….well, as I have written a book, here, I shall take leave my pouring out my thoughts at this juncture. One foot in front of the other, as you are doing, Jeff. And by the way your writing is beautiful. And please seek counseling for depression! You are not alone……we all have help and love from the unseen world. Just ask and remember to thank them and then be very alert for their guidance. I like to ask St. Germaine of the violet flame to help me transmute the negativity and transform my life (and others) to something greater than it already is. Just keep going in the right direction and keep your “eye” on the goal. Try to focus on that and what your blessings are, rather than your problems. You are loved!!! Oh, and don’t forget to love your SELF. Suffering and trials are experiences for our success in our future! Persevere, prayer and most of all FAITH in the bigger picture! Faith that it WILL work and make you stronger and wiser! Another lesson to pass onto your children of what to do and what not to do for a successful start! Each one of us has their own journey and most times advice is not heeded but still great to give from sage people such as yourself! I pray you and your family are receiving blessings for we are all one and I care you are well! Signs and wonders are an exciting part of the faith walk…..It brings such Joy….. IN THE FRUITS OF THE SPIRIT OF GOD….. PRAISE AND THANK GOD CONSTANTLY ….for everything you have to be thankful for …especially GOD AND JESUS….for they are all good and derserving of all you LOVE. FOR A BETTER LIFE AND BETTER DAYS!!!! !